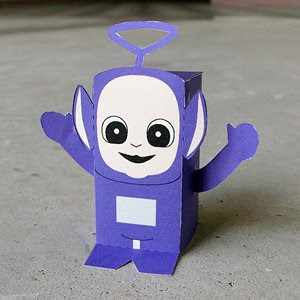 Tinky Winky is one of the four colorful characters from the BBC children's television series, primary aimed at pre-school viewers, produced from 1997 to 2001 by Ragdoll Productions. Created by Anne Wood CBE, Ragdoll's creative director, and Andrew Davenport, who wrote each of the show's 365 episodes, the program rapidly became a critical and commercial success in Britain and abroad. Although the show is aimed at children between the ages of one to four, it has been a substantial cult hit with older generations. Tinky Winky (the purple Tubby) is the largest of the Teletubbies, with a triangular antenna on his head. He is notable for the red luggage (described by the show as a "magic bag", but often described by other media as a handbag) he carries. His character has caused much controversy due to allegations that his character's behaviour carried homosexual undertones. Somehow I always knew this teletubbie was the gay one, even as a child. good idea for a series though! Even though, I really don't like the Teletubbies, this one looks really good! By the way: Do you plan to make Batman? That would be REALLY great! Thanks, I will definitely make Batman one of these days, and in a few different costumes. And Robin too! This is great! Are all of the toys going to be available in pdf for download at some point? these are awesome. i would like to request storm shadow from g.i. joe and a skull leader from robotech. very, very impressive. Any chance you could make Cloud Strife from Final Fantasy VII?? Supersebas, I will consider the idea of letting the readers vote for what they want to see next - I just need some time to work things out. I am also planning a toy-designing contest for everyone soon! Adamlo, I will try to make every toy available for download. Mark, I have put your requests down in my notebook. Thanks! Alex, I will try my best to see to your suggestion. anyways, can you please do ralph wiggum from the simpsons (maybe with a bottle of glue in his hand? :D) and maybe other simpsons characters? keep up the wonderful work! i can't get enough of your toys! Thanks bo, I will definitely do some characters from the Simpsons and Futurama perhaps in the near future!